French onion soup is one of the greatest soups to ever be invented, in my humble yet educated opinion. It is humble in its ingredient list (onions, beef broth, water and maybe a little butter) while the top is something that I like to consider art. A piece of bread, topped with a liberal handful of Gruyere cheese. And then baked until melty and crispy. It’s glorious. I often wonder, why don’t we do this with ALL soups. Well, I’m here to say we absolutely can and we should! This soup, similar to French onion soup’s base, is chill. Not a ton of ingredients and not particularly heavy. I mean it’s technically vegan. I added no cream or butter or any of that because it’s not really necessary. The tomatoes are at their best this time of year and I say let them stand alone. But when it comes to the top, well, we need cheese. And lots of it. The cheese toasts add a wonderful warm and cozy element to an otherwise healthy and bright soup. They make it a bit more rich and indulgent. Both things I love. But more than anything, I love the balance of this soup. As we get closer to crisper days, I say we should celebrate with making more and more soup in the style of our beloved French onion soup. To Make the Roasted Tomato Hatch Chile Soup: Preheat oven to 300 degrees F. To a baking sheet, add the halved roma tomatoes, red bell peppers, hatch chile (this is for the toasts), halved hatch chiles, onion and garlic cloves. Sprinkle everything with salt and drizzle with the olive oil. Transfer to the oven to roast for about 1 hour, until they’re super juicy and a little shriveled up. Let them cool slightly on your kitchen counter. Using a pair of tongs, add the roasted tomato, bell peppers, onions, garlic cloves and one of the hatch chiles (we’re gonna use the other hatch chile for the toasts). You may need to do this in batches depending on the size of your blender. Pulse until smooth, about 1 minute. Pour the soup into medium pot, set over medium-low heat. Meanwhile, dice up the hatch chile and set aside. Bring to a gentle simmer for about 20 to 30 minutes, just so all of the flavors merry together. Give it a taste and add salt to taste (you’ll probably need at least a few teaspoons). 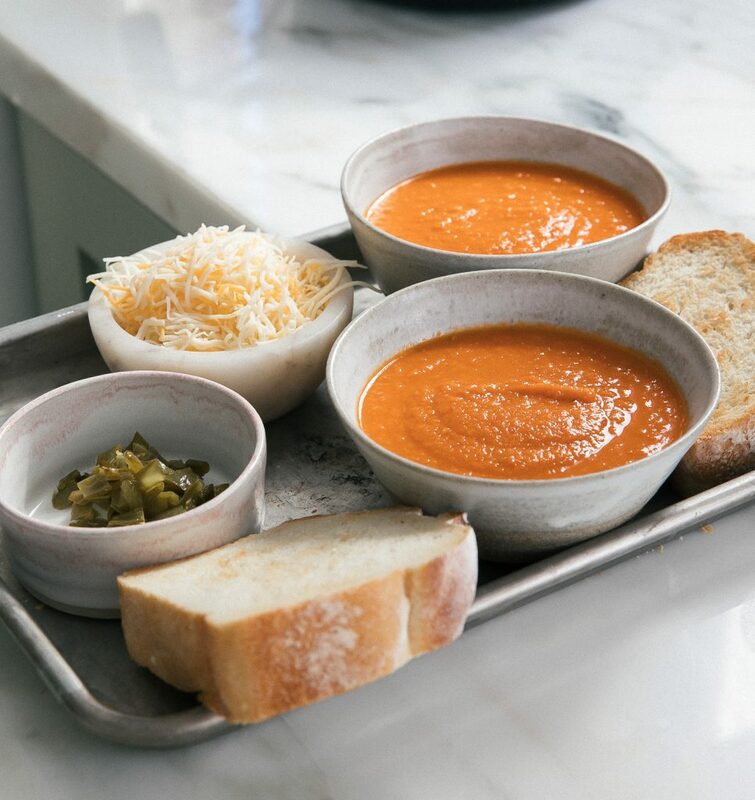 To Make the Cheesy Toasts: Preheat the oven 350 degrees F. Divide the soup into oven-safe bowls and place them on a baking sheet. This makes it easier to take out of the oven. 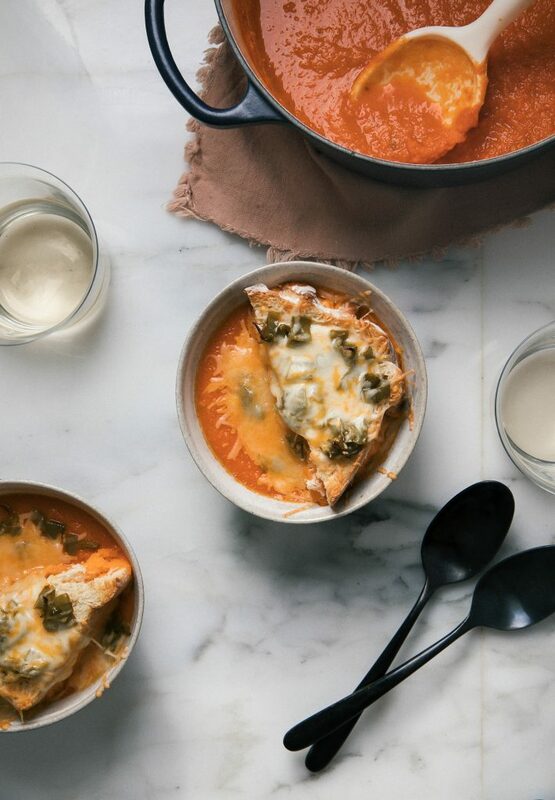 To the top of the soup, add a slice of bread and top with the chopped hatch chile and a generous handful of cheese on top. Transfer to the oven to bake for about 10 minutes, until the cheese is all melty.